The trade conflict between the U.S. and China has escalated when first, the U.S. and then China, took turns to impose tariffs and counter-tariffs on one another’s exports. After a few rounds of actions and retaliations between the two countries, the U.S. and China have agreed to a 90-day ceasefire starting December 1, 2018 to allow both sides to negotiate and reach an agreement. In the ASEAN+3 region, the spillovers from the U.S.-China trade conflict may arise not only from trade destruction effects, which are mainly negative, but also from trade diversion and investment diversion effects which could potentially have positive effects for several economies. As one of the major ASEAN economies, Thailand is facing both challenges and opportunities from the trade war. The possible impacts of the trade war on Thailand are also multi-faceted. On the one hand, there are trade destruction effects which could adversely affect other Thai industries supplying intermediate goods or those that are part of the global value chain. In addition, there could be an overall reduction in imports from the U.S. and China resulting from lower growth in those economies as a result of the trade war. The negative trade destruction impact could be quite large as the country’s growth is highly dependent on trade, although Thailand’s exports have diversified over the years which should lessen the negative effects of the U.S.-China trade conflict. At the same time, there are Thai industries that may benefit from the U.S.-China trade conflict as the U.S. and China import more substitute products from Thailand. Likewise, some Chinese or U.S. firms may relocate their production to Thailand as a way to get around the additional tariffs on domestic exports. Overall, our estimate is that the total net effect of the US-China trade conflict on the Thai economy will be marginal. The potential winners are Thai industries that export final products in competition with the US and China, while the potential losers are Thai industries that export intermediate goods to China or US for processing into final products destined for export to those two countries. According to the preliminary results of our study which analyzed the impact of US tariff on USD50 billion worth of Chinese goods, Thai industries in the motor vehicle and other transport equipment production, as well machinery and equipment exporters will experience a marginally positive impact, while industries such as chemical and rubber products will experience negative effects of 0.005% and 0.003% of GDP respectively. For example, a large automotive parts manufacturer in Thailand shared with AMRO that the firm is confident it can weather the impact of the trade conflict thanks to its geographic spread both in terms of manufacturing as well as markets,. It has factories in Michigan and Kentucky in the U.S., and is a supplier to all the big-three automobile manufacturers there, besides also producing for TESLA and supplying aluminum car bodies to a few other companies. In all, the company has production units across seven countries, including in China, and its main production base in Thailand targets exports markets in ASEAN, E.U., and the Middle East. We could also see some Chinese or even U.S. companies relocating some production activities to Thailand as a way to bypass the tariffs. 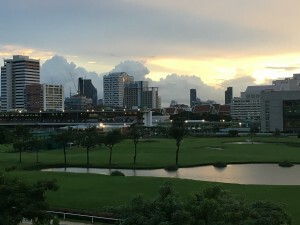 For instance, one survey of U.S. companies operating in China conducted in August and September 2018 found that 18.5 percent of respondents had either relocated or were considering relocating manufacturing facilities from China to the ASEAN region due to concerns arising from the U.S.-China trade conflict. Although the impact of the trade conflict on the Thai economy is not expected to be severe, the government could consider adopting some measures to mitigate the potential negative impacts on some sections and to use the opportunity to enhance efficiency and productivity. First, the Thai government could encourage companies to produce more finished goods for export that can absorb the intermediate goods. Additionally, Thai companies should also be encouraged to diversify their export markets so that they reduce their reliance on the U.S. and Chinese economies for their exports. Second, Thailand could strengthen efforts to promote inward foreign direct investment and present itself as a viable and attractive destination for manufacturers looking to move their production out of China. And third, the government can help suppliers affected by the trade conflict to restructure their operations. In particular, the government can support Thai companies’ outward direct investment efforts and diversification strategies.